Cities and Regions in Cross-Border Cooperation: Competing or Complementary Dynamics? On 17th May, I convened and chaired a session on cities and regions in cross-border cooperation at the Border Regions in Transition (BRIT) annual conference. The conference took place in Hamburg (Germany) and (Sonderborg) two hundred kilometres to the North and across the border in Denmark. The conference was jointly hosted by the University of Southern Denmark (Centre for Border Region Studies), HafenCity University Hamburg and University of Hamburg. The theme of the conference: Cities, States and Borders: from the Local to the Border placed emphasis on the evolving roles of cities in relation to nation-states and their territorial borders in the context of economic globalisation and securitisation. Against this background, the session on cities and regions in cross-border cooperation sought to explicitly address the dynamics of cross-border regionalism and city-regionalism through critical reflection on empirical case studies located across Europe. It is evident that European cities and regions can and do benefit through cooperation across nation-state borders and the realisation of the development potentials of cross-border functional regions. The well-known cases of Öresund, Basel Metropolitan Area, Lille, Luxembourg and Geneva demonstrate clearly that territorial borders need not present insurmountable obstacles to metropolitan regional development (Sohn et al. 2009, Hansen 2013, Fricke 2015). In cross-border metropolitan regions, governance capacity is matched by functional integration and a comparatively high density of cross-border economic, social and cultural relations. Cross-border contexts characterised by asymmetrical spatial development structures face more significant challenges in the establishment of mutually beneficial cooperation initiatives (Calzada 2015). Indeed, as cross-border cooperation in Europe matures, it is increasingly apparent that cities and regions tend to follow distinct strategies and as a consequence multiple partnership initiatives often emerge within the context of larger cross-border regions. As connectivity between cities and metropolitan regions increases, neighbouring rural hinterland regions may face a relative loss of connectivity and become further marginalised. Relational processes of metropolitanisation and peripheralisation are shaped by the spatially selective opening of borders and the associated construction of cross-border corridors and gateways. May own paper within this session concerned the emerging Fehmarnbelt region at the border between northern Germany and southern Denmark and the role of the cities of Hamburg and Copenhagen and their respective metropolitan regions in this context. The book: Soft Spaces in Europe: Re-negotiating governance, boundaries and borders has been published this summer. It is edited by Phil Allmendinger (Cambridge), Graham Haughton (Manchester), Jörg Knieling (Hamburg) and Frank Othengrafen (Hannover). 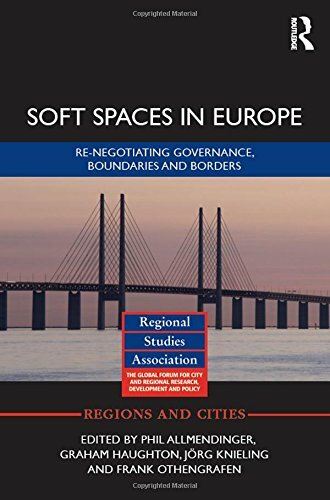 Through five metropolitan and three cross-border case studies, edited volume greatly contributes to a comparative understanding of soft spaces as an emerging element of the contemporary governance landscape in northwest Europe. The author of this blog (Cormac Walsh) was responsible for the case studies of the island of Ireland and Fehmarn Belt region (Chapters 7 & 9) and contributed to the study of the Hamburg metropolitan region (Chapter 3). Previous versions of the chapters were presented at international conferences in Tampere, Finland (Fehmarn Belt) and Dublin, (island of Ireland). The past thirty years have seen a proliferation of new forms of territorial governance that have come to co-exist with, and complement, formal territorial spaces of government. These governance experiments have resulted in the creation of soft spaces, new geographies with blurred boundaries that eschew existing political-territorial boundaries of elected tiers of government. The emergence of new, non-statutory or informal spaces can be found at multiple levels across Europe, in a variety of circumstances, and with diverse aims and rationales. This book moves beyond theory to examine the practice of soft spaces. It employs an empirical approach to better understand the various practices and rationalities of soft spaces and how they manifest themselves in different planning contexts. By looking at the effects of new forms of spatial governance and the role of spatial planning in North-western Europe, this book analyses discursive changes in planning policies in selected metropolitan areas and cross-border regions. The result is an exploration of how these processes influence the emergence of soft spaces, governance arrangements and the role of statutory planning in different contexts. This book provides a deeper understanding of space and place, territorial governance and network governance.